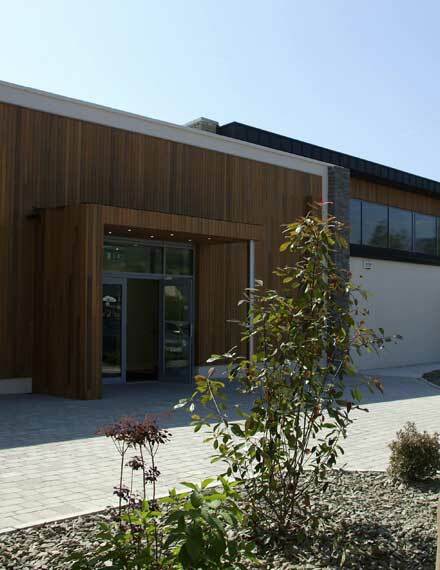 Guests of the Kenmare Bay Hotel are encouraged to enjoy the extensive facilities available to energise and soothe both body and mind. We offer a selection of gift vouchers, as well as discounted rates on all new and renewed memberships. 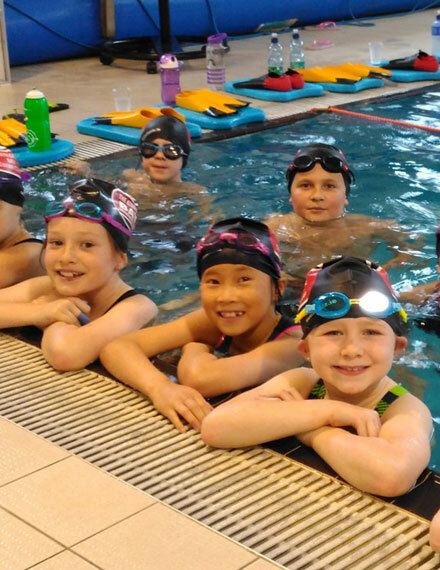 The Bay Health Club Swim Academy follows Swim Ireland's "Learn to Swim" national programme. This specially designed professional swim programme sets national standards for children's swimming. Our Parent & Toddler swim lessons are designed to help parents introduce their children to water and teach them new skills. We follow Swim Ireland's "Swim a Song" national programme. This class runs during school term-time, subject to demand. Our under 5s swim lessons are structured in a way that introduces young children to the water and helps build their confidence. These classes run during school term-time. Our children's swim lessons are offered from Beginners to Advanced, following the Swim Ireland "Learn to Swim" programme. These classes run during school term-time. Call to the Health Club reception to arrange private swimming lessons. 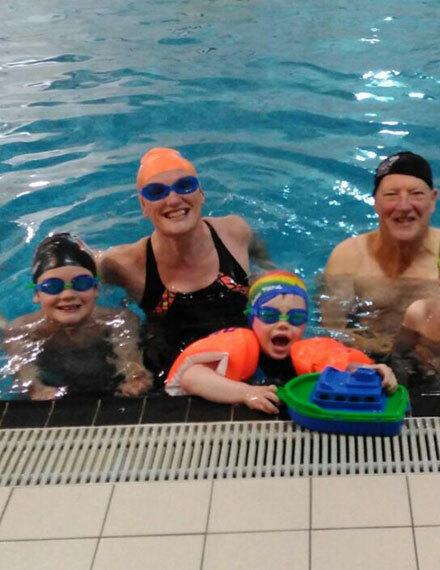 Our swim teachers have all the price details for both children and adults (including one-off stroke analysis for adults), and they will schedule times that suit you for lessons. Prices are adjusted in line with the number of swimmers under instruction. They can take your details and times that suit you most for lessons. They can take your details and times that suit you most for lessons. Prices will be adjusted for more than 1:1 sessions. Please Note:Call to the Health Club reception to arrange private swimming lessons. Our swim teachers have all the price details for both children and adults (including one-off stroke analysis for adults), and they will schedule times that suit you for lessons. Prices are adjusted in line with the number of swimmers under instruction. They can take your details and times that suit you most for lessons. 1: Call in to the Bay Health Club. 2: Fill out an application form. Places are limited and allocated on a first-come, first-served basis. 4: Enquire at the Bay Health Club for further information. 5: Receive discounts on classes with membership. 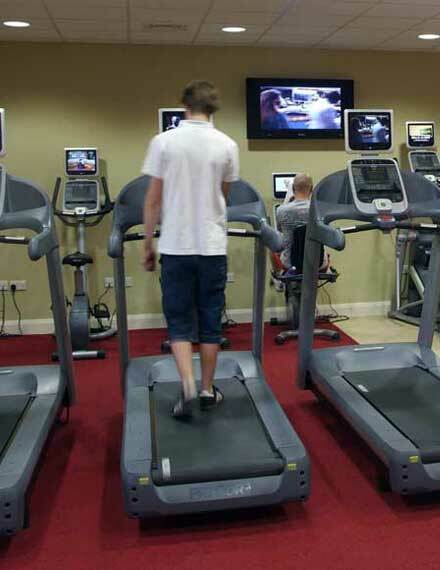 Membership includes unlimited use of the leisure facilities 7 days. Children under the age of 2 years are complimentary. Day Visits are between the hours of 12-4pm only. A central aim of the swim club team is to give children in Kenmare and the surrounding area the opportunity to swim competitively. Coaches constantly monitor each swimmer's development, ensuring they are moved to the squad appropriate to their skills. Children who progress well through the lessons provided at the pool are eligible to put their name forward to join the club if they commit to the 30-week training programme. The club focuses on improving technique in the younger squads and on enhancing competitive turns, times, etc. in the older squads. All swim club members must be interested in competing in the long term, once they meet the criteria. 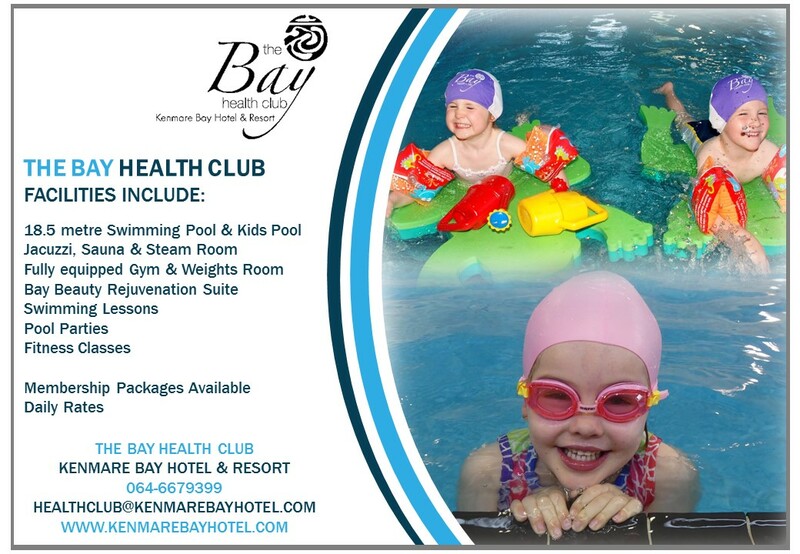 There is a huge demand for places in the club among children keen to compete and swim for the Kenmare Bay Swim Team. Any Shark or Dolphin swimmers interested in competing in galas must inform Laura by October 14th each year, so that swimmers can be registered as competitors with Swim Ireland. About 5 or 6 swimmers can be entered until the summer. Swimmers pay a fee of €12 (approx.) to enter each gala. This allows the swimmer to enter as many races as they wish on the day. Please pay the fee to the health club before the gala. Take the stress away of party planning! 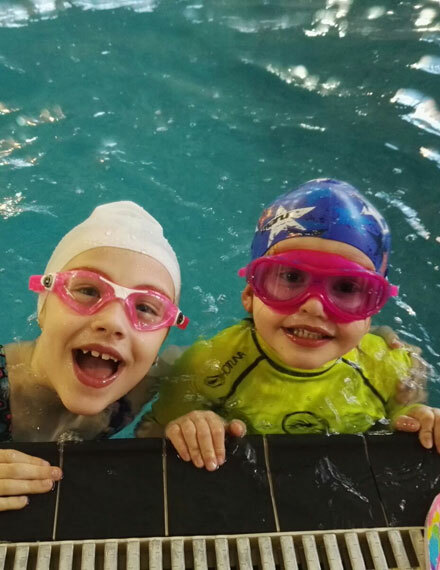 Book in your little swimmer for a birthday party which includes a 1-hour swim, hot food and use of our secure playground. €11 per child and birthday child is FREE (minimum of 8 children per party). 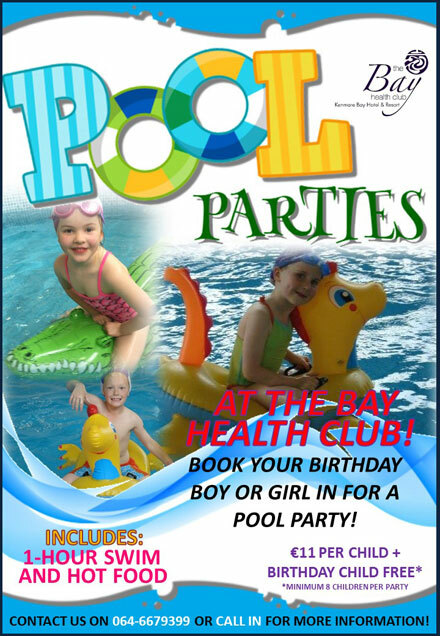 €10 per child and birthday child is FREE (minimum of 8 children per party). Our Fitness Classes run during school term time and are complimentary for Residents and Members. Classes must be pre-booked in person at The Bay Health Club Reception, Ext. 126 or 064 6679399. Subject to capacity. Please note timetable is subject to change. Prior notice will be given.